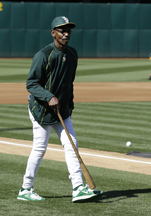 Ron Washington sat in the opposite dugout from the one he used to manage the Texas Rangers, still with his ever-present passion for the game while talking about his role with the Oakland Athletics. Washington was excited this week to be back in the stadium where he twice led the Rangers to the World Series in his eight seasons as their manager. He loves being back in the majors as a coach and infield instructor. While he can be in uniform, he can’t be in the dugout during games. And the 63-year-old Washing­ton would like to get the chance to manage again.